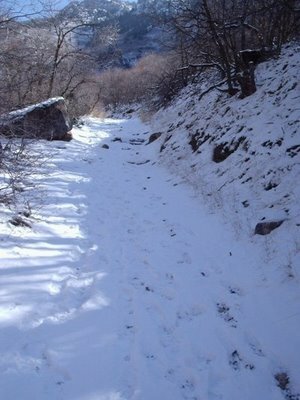 The snow has melted of the trail up Slate Canyon, but now it is getting mushy. Even though the trail is so rocky that it never really gets mud that sticks to the bike it get so soft that it makes it real hard to pedal. Also today a huge rock fell onto the trail. I'll have to remember to bring the camera and get a picture of it. This image is from a few weeks ago. This snow is now gone.